Nash-Kelvinator saw the American desire for smaller cars -particularly marketable towards women - beginning to make an appearance. With the introduction of the VW Beetle to the US market, they didn't want the Yankees to be left out. They embarked on a plan for a small and inexpensive personal car. Nash decided that building such a vehicle from scratch wasn't going to be cost effective and eventually teamed up with Austin-BMC of England to do the work. The car would be manufactured there using a variety of Austin bits, including the B-series 1.2 and later 1.5 liter engines. Several exterior variations occured through the years, though essentially they maintained the "Nash" family look. Though produced in the UK, less than 2,000 of the nearly 10,000 Metropolitans were sold there, and only the earlier models carried an "Austin" badge. 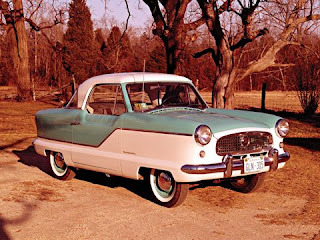 Though sales were not bad, Nash ended production of the car due to internal competition from the AMC Rambler, which was significantly larger and not much more expensive than it's diminutive English cousin. Back in the days when Chrysler was actually buying-out companies rather than trying to stay alive, they acquired the Rootes Group of England. 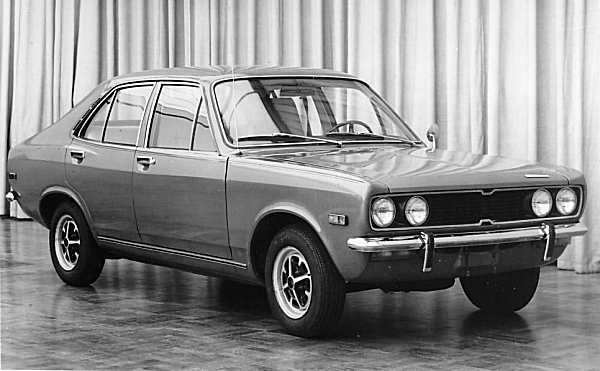 During that time, the Hillman Avenger saloon and estate was developed and sold under a variety of names throughout the world. Notably, even as a Volkswagen 1500 in Argentina. 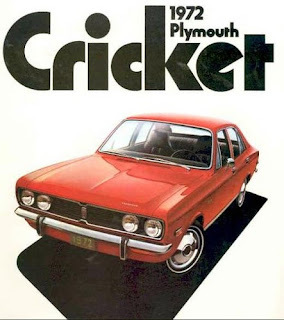 The English market looked upon the Avenger favorably and so, in 1971 it found its way to American shores badged as the Plymouth Cricket. Conveniently, being of Anglican decent, it used SAE fasteners and the 'Coke bottle' styling fit with the rest of the Plymouth range. Unfortunately, it was also rather unreliable, underpowered (70 hp from the 1.5L engine) for American tastes, and had a tendency to rust rather badly. By 1973 Chrysler gave up on the Cricket and the final model year was simply to dump the remaining stock. Known internally as the "C2", the Simca division of Chrysler Europe somewhat unwittingly produced a true "World-Car". 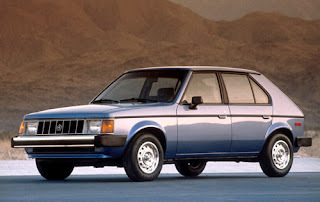 The 1977 launch of the Chrysler Sunbeam and Simca / Talbot Horizon from Chrysler Europe came at a time when the American counterpart was facing real trouble as a result of the fuel crisis. The decision was made to bring the new design Stateside. The US cars were in fact American built, but little about this car was American at all. The European versions utilized Simca sourced drive-trains, whereas in North America, a Volkswagen manual transmission and 1.7 liter engine was used initially though they sported a Chrysler-designed head (complete with traditional Mopar valve clatter). The VW engine was used until 1983 and was then replaced with a 1.6 liter Peugeot/Simca unit. Eventually the "L-body" American versions would see a variety of engines including a two turbocharged units from Chrysler itself - some Shelby versions even! The American cars also utilized different suspensions - A pity considering Europe got a Lotus-tuned version of the Talbot. Chrysler Europe was sold to Peugeot for $1.00 in 1978 amidst horrible monetary hemorrhaging - the same year the car began to roll off US production lines. 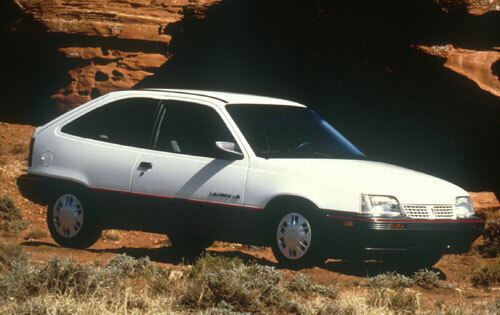 The Franco-American hatchback met its demise in 1990, four years after the PSA group allowed the sun to set on the Horizon overseas. Opel Kadetts have been a major seller throughout Europe for decades as an affordable economy car. Beginning with the "D" variant, the Kadett became front-wheel-drive. The "E" variant continued using the "T-Platform" of the "D" but with updated aerodynamic fast-back styling. At best, this, the last of the Kadett evolution, was "crappy". Nevertheless, GM never lost an opportunity to make an easy buck and the rights were sold to Daewoo of South Korea. 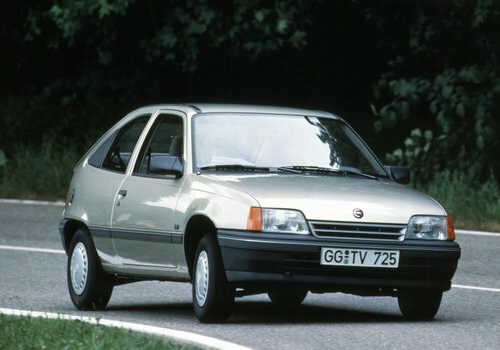 At the same time the decision was made to have Daewoo produce the Kadett for the North American market under the rather presumptuous "LeMans" badge. 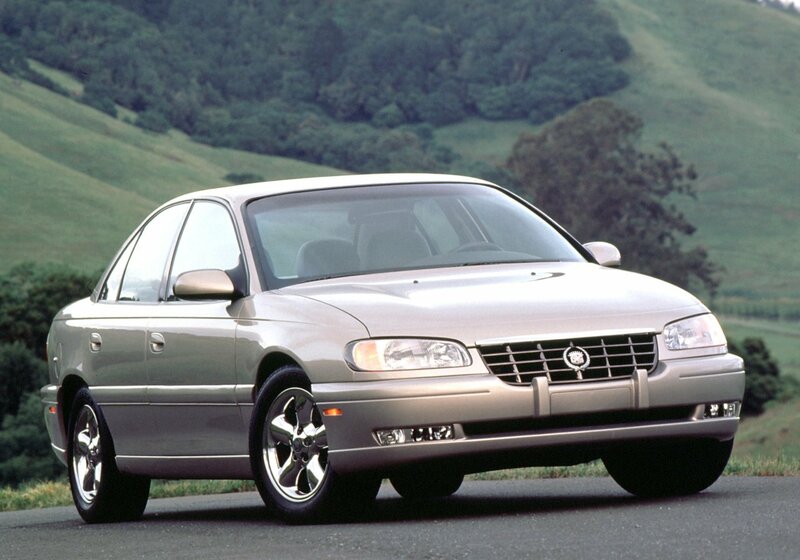 A sedan was also made with a 2.0 engine and a wheezing 96 hp. The end result was perhaps one of the General's worst offerings to date. The horrid build quality killed the car even in it's "home" Korean and German markets and it provided a less than stellar book-end to the Pontiac LeMans series of performance cars. 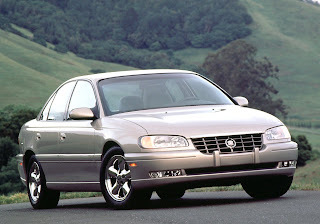 The "Caddy that zigs" was more like the "Caddy that gags". Intending to appeal to a more youthful market with the Cadillac brand, the Catera promised performance and handling like that of a European sport-sedan. 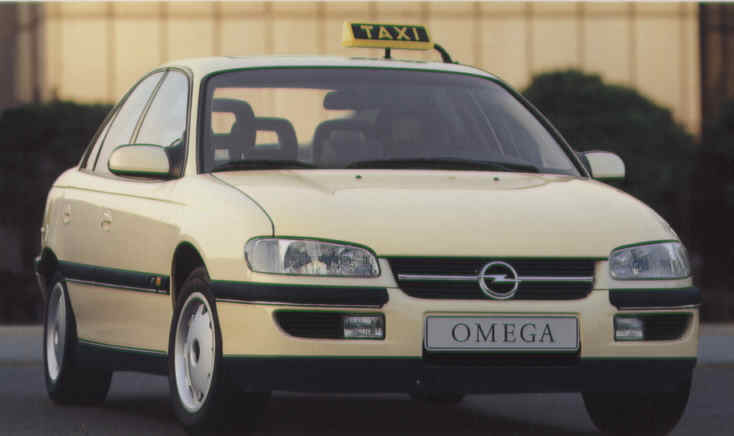 Well, they were almost there when they chose the Opel Omega sedan as the basis. Though "sporty" is up for considerable debate. The car was rather 'lame' in terms of excitement and just down-right bad in terms of quality. Numerous issues plagued the German built Cadillac from unacceptable tire wear due to suspension settings to complete failures of its L81 V6 (a unit which would plague numerous GM-built Saab models as well). Not to mention the fact that the car's "styling" was more like a gaudy patterned polo shirt than the cheap suits of other Cadillacs from the era. In 2001, poor sales led to the Catera's death and it was the final guise of the Omega B to be offered after European sales ended in 1999. We could of course go on to discuss more; the most recent Pontiac GTO, the Saturn Aura and Astra, and even the latest Chevrolet Malibu. But then really, havn't we all heard enough about GM lately? It of course will also be interesting to see what Fiats make it here in the coming years via Chrysler's lineup. Ford is of course absent here, as they have long had a significant European presence. While occasionally some make it here, I think it's safe to say the Focus, Cortina, old Xr4ti's, and so-on need not be grouped with the above examples. From the Dauphine to the Twingo: Amédé Gordini's work with Renaults. Despite being a native of Italy, Amédé Gordini (born Amedeo) became well-known for his work with French manufacturer Renault. He was born in northern Italy in 1899 and at 27 years old he moved to France to work for Fiat’s racing team. He had great success as a racer but this article will focus on his work with Renault. Gordini made the decision to quit racing in the mid 1950s due to financial problems. He pulled out almost completely when Pierre Dreyfus, Renault’s CEO at the time, approached him in 1956 to ask if he would take the reins of their motorsports division. 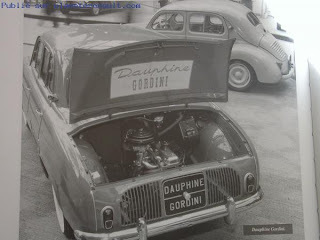 Gordini accepted the offer and got to work on his first project, the Dauphine Gordini. The Dauphine Gordini was not as heavily modified as subsequent Gordini models would turn out to be. In fact, the true sport version of the Dauphine wasn’t the Gordini but the 1093, a model that put out 55hp and that Renault built in very small numbers for homologation purposes. Interestingly enough the 1093 borrowed a fair amount of parts (12 volt electrics, larger headlights, etc) from the Dauphines built for export to the US market. Back to the Dauphine Gordini: one of the most important modifications was the use of a 4-speed transmission instead of the standard 3-speed. Gordini also raised the compression ratio and modified the head which raised the rear-mounted Ventoux engine’s output to 37hp, a small gain over a standard Dauphine. In 1960 minor modifications gave the engine 40hp and to make it a more appealing car Renault transferred the Ondine’s extra equipment (chrome side strips, cloth on the door panels, etc) to the Gordini. From 1964 until it was phased out in 1967 the Dauphine Gordini offered better braking thanks to four disc brakes transferred over from the Renault 8. The next model Gordini modified was the Renault 8. A boxy four dour sedan introduced in 1962, the Renault 8 was the last rear-engined car made by Renault. The engine was a brand new four-cylinder 956cc unit that had already been installed in the Caravelle and the Estafette. The 1964 press release introducing the Renault 8 Gordini began with the phrase “the Renault 8 will allow everyone who enjoys or has ever dreamed of driving a sports car to satisfy their passion without paying more than they would for a mass-produced car.” This was the first model to sport the French blue and white stripes paint combination that later made Gordini models instantly recognizable. Amédé Gordini (who by this time had become known as “le sorcier”, or “the sorcerer”) redesigned the head and bored the engine out to 1108cc. 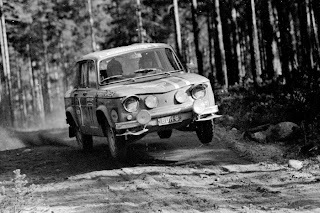 While that may not seem like much, it allowed the Renault 8 Gordini to achieve a top speed of about 110mph. And while that may not seem like much either, keep in mind that at the time a Citroen DS19, the goddess of the road, had a top speed of roughly 100mph. Case in point: very few sedans could keep up with the Renault 8 Gordini; the ones that could cost double the price. The Renault 8 Gordini had a tremendously successful career in racing. 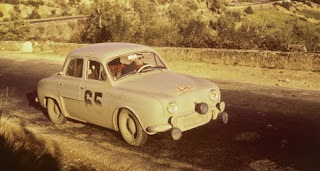 It won the Tour de Corse in 1964, 1965 and 1966. In all three of the races it competed against much more expensive cars: in the 1964 race second place was an Alfa Romeo Giulia TZ; in 1965 an Alpine A110 came in second and sixth place was awarded to none other than an Alfa Romeo GTA; lastly, in 1966, second and sixth place were GTAs but perhaps more eye-opening is that the recently-launched Porsche 911 driven by Vic Elford placed third. 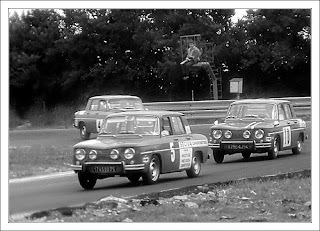 A Lancia Fulvia HF won the race the next year and the best Renault 8 Gordini placed seventh. In 1966 a race series exclusively reserved for Renault 8 Gordinis, called the Coupe R8 Gordini, was launched. It became a type of racing school for would-be race car drivers who could take their R8s out and flog it around a racecourse, often door to door or bumper to bumper, while learning how to master their tail-heavy car. This was also meant to prove to the public that Gordini versions were much more than mere blue paint, these were actual race cars you could take to the track. 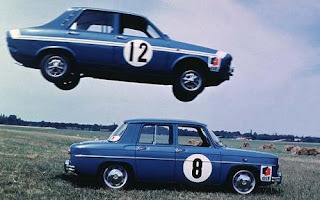 Also in 1966 came the ultimate evolution of the Renault 8 Gordini, the Gordini 1300. As its name implies the engine had a displacement of 1300cc (110hp) and the car was easily distinguishable from its 1100cc counterpart thanks to its four headlights. With the 1300 Gordini also remedied what critics complained about the most with 1100: the car now had a 5-speed gearbox. 1970 marked the end of the Renault 8 Gordini and the Coupe R8 Gordini. The standard Renault 8 lingered on showroom floor until 1973. Renault purchased the rights to the Gordini name in 1969, the same year it launched the all-new Renault 12. The launch of the Gordini version was pushed back several times but it was finally launched in July of 1970. This car faced the near-impossible task of replacing the R8 Gordini in competition, on the sports car market but also in the hearts and minds of young enthusiasts. For the engine a 1565cc was borrowed from the Renault 16’s parts bin and sent to the Gordini workshop for modifications that included a pair of two barrel Weber carburetors. In sharp contrast with the Renault 8 the engine (like on all Renault 12s) was front-mounted and turned the front wheels. 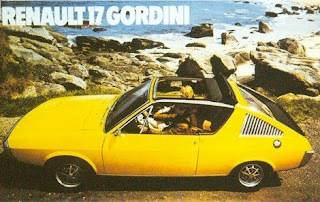 When all was said and done the Renault 12 Gordini pushed out 113hp and was good for about 115 miles per hour in 5th gear. The car was finished in French blue with white stripes but some versions were orange with white stripes. Over the years numerous Renault 12s have been painted to look like Gordinis but the quickest way to tell from a distance if it’s a real Gordini or not is to look at the fuel filler: on standard R12s the fuel filler was located to the right of the license plate; on a 12 Gordini it comes out of the left quarter panel. 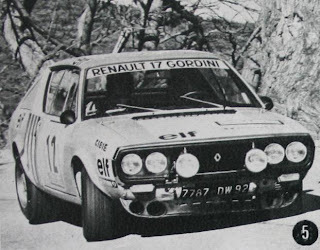 The last Renault model to sport the Gordini name was the 17. The 17 itself was launched in 1971 as a coupe version of the Renault 12. The launch of the 17 merits another sway from the Gordini story: Renault launched the 17 with a sister model, the 15. The 15 was a standard hardtop coupe while the 17 could be ordered either as a hardtop coupe or with a large cloth sunroof. The 15 had large rear side windows while the 17 had smaller ones to accommodate metallic louvers. The front was also different, with the 17 having four round headlights (vaguely reminiscent of an Alfetta) and the 15 two square lights like the Renault 12. 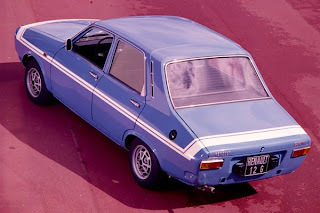 When the Renault 12 Gordini was phased out in 1974 Renault took a Renault 17 TS, offered more standard equipment like tinted windows and called it the Renault 17 Gordini, the last Gordini model of the 20th century. The engine was a 1600cc four-cylinder unit that used Bosch fuel injection and put out 108hp. 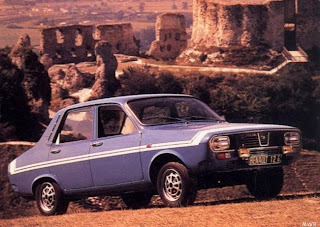 Perhaps the most notable aspect of the Renault 17 Gordini was its ability to make the arguably-failed Renault 12 Gordini look like a commercial success. No race series was developed for this car and truth be told it had precious little in common with its Gordini roots. Unlike previous Gordinis the most common color was not blue with white stripes but yellow. It was phased out in 1977. Renault did race it with some success in various rallies around the world but competition from the Renault-Alpines, as well as the plans for the upcoming Renault 5 Turbo, put its racing career to an end. The Renault 15s and 17s left showroom floors in 1979 and were replaced by the Fuego, a coupe version of the Renault 18 that replaced the 12. Amédé Gordini died in 1979 and was buried in Paris. 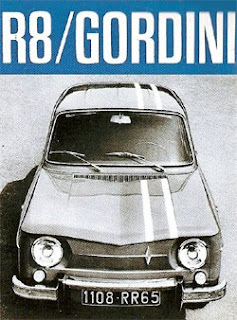 So why bring back the Gordini name? 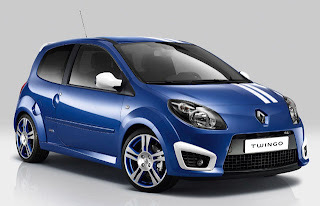 Patrice Duclos, director of Abarth in France, explained that “it’s always easier to relaunch a nameplate, even if it’s not very well known, than to create a new one.” The next Renault Gordini to hit showroom floors is the Clio Gordini which will be closer in spirit to the Twingo Gordini than the 8 Gordini. For more Renault content click on the "Renault" tab on the right of this page or click this link. And, have a look at our Facebook page to find photos that aren't on this site or discuss some of the cars we feature in these pages. A recent trip to Portugal left me amazed with how many old cars are running around in good shape. Even cars from the 1990s that you typically find in terrible shape here like a Citroen AX or a Peugeot 205 still sport shiny paint and untorn interiors. In the city of Porto I spotted classic cars by the dozen, below is a sampling of what is around. By far the most common classic cars are 1980s Mercedes sedans. A fair amount of w201 190s (of both the E and the D type) still roam the streets as taxis and private cars. w124s are plentiful as well but w210 E-Classes seem to slowly replace the taxis. And, plenty of people still enjoy the bomb-proof w123s as their daily transportation. If you own a Mercedes in Portugal there are two fairly active clubs, the Clube w123 Portugal (exclusively for w123s, though other vintage Mercedes are invited) and the Mercedistas club (open to all Mercedes). As some readers will recall, the silver '74 Porsche 914 my father and I had been continuously restoring since 1999 was wrecked. After much consideration, my dad and I decided that repairing the car at this point wasn't going to happen and the search began for another 914. Earlier this March, a very nice Marathon Blue 1974 914 1.8 appeared on eBay and later that week we were the proud new owners. The original owner, according to the original owner's manual, was a Ms. Ursula Nelson of Hyannis Massachusetts. She purchased the car from Hyannis Porsche + Audi on February 26th, 1974 with 10 miles on the odometer. On April 23rd of that year, she had it brought in for the scheduled "600 Mile Service" with 1,060 miles and finally stopped having Porsche+Audi service the car after that. Undoubtedly due to their notoriously high prices. At some point, the car was sold to an owner in Vermont, and then to another owner in New Hampshire in 1993. He recently passed away, and the car was then put up on eBay by his family. Always garaged, never driven in foul weather, and expertly maintained by Porsche specialist Blair Talbot Motors in NH, the 'new' blue 914 was even better than we had expected. The best way to describe this example is "original" - very original. From the fully intact tool kit, to the vintage Michelin ZX spare tire mounted on a VW rim, and even the functioning Sapphire radio and VDO clock. The car is powered by its original 1.8 L fuel injected "Type 4" engine, though curiously, it sports a 2.0 badge added by a previous owner. The car only has 55,000 fully documented miles on it, and every detail including its spotless interior and engine bay as well as gleaming trim and perfect panel gaps will attest to that. It's equipped with the "Appearance Group" options which include center console with gauges, and leatherette wrapped steering wheel. Unlike our silver 914, which was built in September of 1973, the blue car has later style instrumentation without the silver button over the gauge needles - one of many slight detail changes during the model run of the 914. This car is also equipped with optional intermittent wipers (though this function doesn't seem to work any longer) and also fog lights from the factory, passenger side rear-view mirror, and Bendix Sapphire XIX radio. Interestingly no 914 ever left the factory with a radio as they were all dealer installed but nearly every North American model had one put in before it made it to the showroom floor. A variety of examples were available, including Becker and Blaupunkt units, though the rather cheap Sapphire was most common. What is not original however, are the wider Continental tires mounted black accented Fuchs wheels and a short-shift kit. (Eventually the wheels will be stripped and fully polished again.) Old-style Michelins are available through Coker Tires for originality's sake, though for a real driver's car the more modern rubber is preferable. It's rare to find an unmolested 914, and driving this car is a real insight into what one would have experienced in 1974. The 1.8 L engine is not exactly what one might call 'sporty' - and rightfully so considering it was intended for the VW 411 and Bus. That's not to say it's a total slug though. It's got ample torque and in spite of it's mere 73 horsepower, the power-plant can still briskly carry the 2300 lb. car. 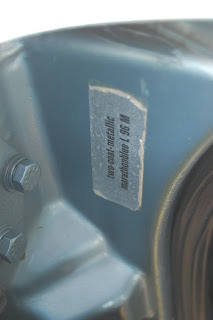 This was also one of the earliest engines to use Bosch's L-Jetronic electronic fuel injection system, which, while rather primitive by today's standards, is really quite good when properly maintained. The 1.8 liter L-Jet engined car is naturally not as powerful as its 2.1 liter Weber carbed stable-mate. Although like all 914s, its well suited to long distance high-speed through-way runs as I more than aware of on the 630 mile drive back from New Hampshire at an average 70 mph. 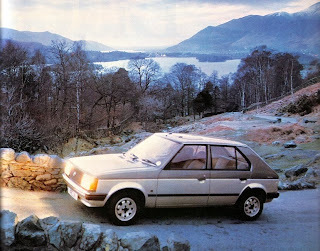 The engine never got hot, the heater worked brilliantly, and the old sealed beam headlights were actually pretty good. The front of the car rides a little on the high side due to US bumper and headlight height regulations, though this is fairly easily changed by adjusting the position of the torsion bars in the 911-sourced suspension. (Note the front of the silver 914, which has had the front torsion bars turned by a few splines to lower and stiffen it.) The short shift kit, as the name would suggest, allows for shorter throws of the gear selector, though it also makes the shifter lower and a little out of reach. The gear selection is quite precise though in spite of the rather complicated mechanism required to reach the transmission at the rear of the car. As with all 914s, the steering is sharp and quick without a hint of play and if fitted with the original 165 SR 15 tires, would be even quicker. Perhaps a little too quick if you're not used to it. That being said, the current 205 / 55 R15 tires are about as wide as you can fit on a 914 without wider fenders and they perform more than adequately. In the future, we intend to fit the car with chrome bumpers and some NPR flat-top pistons to make the engine displacement 2 liters, as well as the aforementioned suspension settings. Perhaps what the car needs most of all is the Porsche crest that 914s never came with. Of course, be sure to check back here at RWP for future updates on this, as well as all of our cars. The 914, while often under-appreciated compared to the iconic 911, is just as true of a Porsche as the first 356 of 1948. A modest economical Volkswagen engine placed in the middle, a lightweight yet solid chassis, superlative handling, and a little radical looking.